Add Timezone to your favourites! Fun anytime anyday at $20 only! Timezone Singapore offers a wide range of arcade games, ranging from Transformers to Initial D7. There are 7 Timezone Singapore arcades located islandwide. 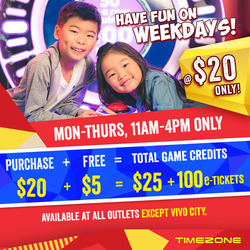 Visit Timezone Rush Vivocity to try your hand at laser maze and mini-bowling! Visit the webpage to find out about the Timezone loyalty programmes. Stand to win fabulous prizes from the extensive range of unique and branded quality products from Timezone's prize counters! Timezone operates in Australia, India, Indonesia, New Zealand, the Philippines, Singapore and Vietnam. The first Timezone Family Entertainment Centre (FEC) opened in Perth, Western Australia in 1978 as a family-oriented video amusement facility. Do you want to receive more offers from Timezone by email?